Roughly 35 species of pine tree are native to North America. These fragrant, attractive and majestic trees are used as windbreaks, ornamental landscape plants and Christmas trees. If you have a pine or two growing on your property, consider yourself lucky. These beautiful trees are not only a joy to have around, but they are quite hardy. Large, established trees thrive under a minimum of care and grow happily with none at all. Fertilize your pine tree once yearly, either in early spring or late fall, for its first five years of growth. Use a 12-4-8 fertilizer prescribed for use on evergreens. Follow the manufacturer's instructions for application rates, which should be around 4 ounces per 10 square feet. Water the tree before applying the fertilizer, then spread it uniformly within the drip line of the tree. Then water the soil again until the fertilizer has soaked into the soil. Pine trees that have been in the ground less than one year or longer than five do not require fertilization. Prune your pine trees in late spring to encourage denser foliage. Pine tree new growth comes in the form of soft, lighter green pine candles. Use a sharp pair of pruning shears to prune the center pine candle at its base while it is still young and soft. Next season, it will grow new buds at that point. Annual pruning in this fashion will train your pine tree to grow fuller instead of taller. Maintain a 4- to 5-inch layer of pine bark or pine needle mulch at the base of your pine tree. This mulch helps the tree to retain moisture, stabilizes the temperature of the soil and provides the tree with essential nutrients. Water your pine tree infrequently. Established pine trees are quite drought-tolerant and only occasionally need supplemental watering. They really only need to be watered in cases of prolonged drought and in the fall when a long, deep watering will help them to store enough water to keep them from drying out in winter. Newly planted pine trees should be kept in moist soil until they produce new growth. Maintain the health of your pine tree by annually pruning diseased or broken branches. These branches should be pruned with a pair of lopping shears or a saw at their base, leaving as little stump as possible. 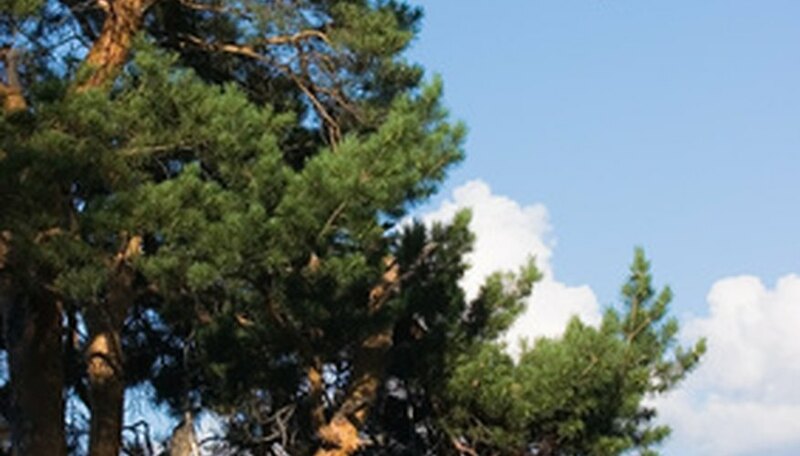 Do not prune your pine trees during the summer. This will lure bark beetles to the area. In some areas, they can attack in large enough numbers to kill a tree. Control attacking bark beetles with pheromone traps.